For other hospitals with a similar name, see Middlesex Hospital (disambiguation). 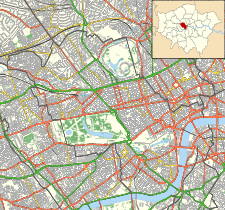 Middlesex Hospital was a teaching hospital located in the Fitzrovia area of London, England. First opened as the Middlesex Infirmary in 1745 on Windmill Street, it was moved in 1757 to Mortimer Street where it remained until it was finally closed in 2005. Its staff and services were transferred to various sites within the University College London Hospitals NHS Trust. The Middlesex Hospital Medical School, with a history dating back to 1746, merged with the medical school of University College London in 1987. The first Middlesex Hospital, which was named after the county of Middlesex, opened as the Middlesex Infirmary in Windmill Street in 1745. The infirmary started with 15 beds to provide medical treatment for the poor. Funding came from subscriptions and, in 1747, the hospital became the first in England to add 'lying-in' (maternity) beds. The foundation stone for the second Middlesex Hospital, in Mortimer Street, was laid by the hospital's president, the Earl of Northumberland, in 1755. The central block of the new hospital opened in 1757. Over the years extra wings were added but, in 1924, it was decided that the building was structurally unsound and an entirely new building would be required. The Duke of York, later King George VI, having visited the hospital on 26 June 1928 to lay the foundation stone of the new building, returned on 29 May 1935 to open the completed building. The hospital had been completely rebuilt, on the same site and in stages, without ever being closed, paid for by more than £1 million of donations from members of the public. After coming under the management of the Bloomsbury Health Authority in 1980, the Middlesex Hospital became associated with various specialist hospitals in the local area. In 1992 the local urology hospitals, St Paul's, St Peter's and St Philip's, were closed down with services transferred to new accommodation in the Middlesex Hospital. The Middlesex Hospital Medical School traced its origins to 1746 (a year after the foundation of the Middlesex Hospital), when students were 'walking the wards'. The motto of the medical school, 'Miseris Succurrere Disco', was provided by one of the deans, Dr William Cayley, from Virgil's Queen Dido aiding a shipwreck: 'Non ignara mali, miseris succurrere disco' ('Not unacquainted with misfortune myself, I learn to succour the distressed'). At the establishment of the then London University (now University College London), the governors of the Middlesex Hospital declined permission of the former's medical students to use the wards of the Middlesex Hospital for clinical training. This refusal prompted the foundation of the North London Hospital, now University College Hospital, in 1834. The medical schools of the Middlesex Hospital and University College Hospital merged in 1987 to form the University College and Middlesex School of Medicine (UCMSM). UCMSM itself merged with the Royal Free Hospital School of Medicine in 1998 to form the UCL Medical School. The Courtauld Institute of Biochemistry of the Middlesex Hospital Medical School was opened by Samuel Augustine Courtauld in 1928, the foundation stone having been laid on 20 July 1927. Its main entrance was in Riding House Street. Courtauld also endowed a Chair of Biochemistry. The Middlesex Hospital closed in December 2005. The main hospital building in Mortimer Street was sold to developer Project Abbey (Guernsey) Ltd, a company controlled by Christian and Nick Candy and was demolished in 2008. The building was used, just before it was demolished, in the film Eastern Promises. Candy and Candy failed in plans to redevelop the site into a 273-apartment luxury accommodation complex, named "NoHo Square", and transferred the property to the nationalised Icelandic bank, Kaupthing Bank. In 2010 the site was purchased by Clive Bush and Daniel Van Gelder's Exemplar Properties and Aviva Investors in July 2010. Exemplar decided against retaining either the Candy and Candy designs or the NoHo Square name and instead appointed new architects in Lifschutz Davidson Sandilands and Sheppard Robson to prepare new designs. Following a public exhibition a planning application for their proposed scheme was submitted in September 2011. Planning consent for the new development, now called Fitzroy Place, was granted in February 2012. The new development, which combines 295 homes with 240,000 sq ft of offices, including the regional headquarters for cosmetics multinational, Estée Lauder was completed in 2016. The former chapel of the Middlesex Hospital by John Loughborough Pearson is now the only surviving building of the Hospital. The chapel was completed after the architect's death under the supervision of his son, Frank, also an architect. The chapel was structurally complete by the mid 1920s and the surrounding hospital then demolished and rebuilt around it between 1928 and 1929. The chapel was not formally opened until 1929 by which time much of the lavish interior decoration of marbles and mosaic in a mix of Italian gothic and romanesque styles had been added, giving it the appearance it broadly retains today. The chapel is a Grade II* Listed building. The fabric of the chapel was allowed to decline in the closing decades of the Middlesex Hospital, with water ingress through the roof causing substantial damage to the fabric of the building. The chapel fabric and interior was subject to a £2m restoration and the building re-endowed with maintenance funds by Exemplar Properties. Never consecrated, named or dedicated, the chapel was given the name "Fitzrovia Chapel". For nearly 100 years, four giant paintings welcomed visitors to the reception area of The Middlesex Hospital. The Acts of Mercy were painted in 1912 by Frederick Cayley Robinson, a distinctive yet elusive British artist, after being commissioned by Sir Edmund Davis, one of the governors of the hospital. Prior to the demolition of the hospital, the art was purchased by The Wellcome Library. ^ a b c d e f g h i j k "Middlesex Hospital". Lost Hospitals of London. Retrieved 10 May 2018. ^ "Hospitals". Derelict London. Retrieved 25 June 2018. ^ Tournoy, Gilbert (2006). Humanistica Lovaniensia: Journal of Neo-Latin Studies. Leuven University Press. p. 242. ISBN 978-9058675712. ^ "UCLH trust chronology". University College London Hospitals NHS Foundation Trust. Retrieved 10 September 2010. ^ "History". UCL Medical School. Retrieved 26 June 2018. ^ "Courtauld Institute of Biochemistry". Nature. 130 (3274): 163–164. 1 July 1932. doi:10.1038/130163d0. Retrieved 10 May 2018. ^ "Middlesex Hospital – The Filming Location of Eastern Promises". Abandoned Spaces. Retrieved 26 June 2018. ^ Keilthy, Paul (31 October 2008). "Noho Square Deal in Ruins". West End News. Retrieved 25 June 2018. ^ Hipwell, Diedre (18 July 2010). "Aviva wins Noho Square scheme". The Independent. Retrieved 25 June 2018. ^ Morby, Aaron (26 September 2011). "New plan for former NoHo Square London site". Construction Enquirer. Retrieved 25 June 2018. ^ Bar-Hillel, Mira (22 September 2011). "Noho Square finally looks poised for redevelopment". The Evening Standard. Retrieved 25 June 2018. ^ Loeb, Josh (9 February 2012). "Middlesex Hospital site gets go-ahead to build 300 homes – Permission granted for £750million scheme". Camden New Journal. ^ "2 Fitzroy Place launches in style". Exemplar. 2015-02-10. Retrieved 2017-08-02. ^ Historic England. "MIDDLESEX HOSPITAL THE CHAPEL (1223496)". National Heritage List for England. Retrieved 1 November 2015. ^ a b "Archifacts Sheet – Fitzrovia Chapel" (PDF). Open House London. Retrieved 1 November 2015. ^ "Acts of mercy. Oil paintings by Frederick Cayley Robinson, 1915-1920". COPAC. Retrieved 25 June 2018. ^ Oxford Dictionary of National Biography, Volume 21. Oxford University Press. 2004. p. 955. ISBN 978-0-19-861371-8. Article by Michael Holroyd. ^ Sikov, Ed (2002). Mr Strangelove: A Biography of Peter Sellers. Sidgwick and Jackson. pp. 381–382. ISBN 978-0-233-99883-1. ^ "Winston Churchill: Aspects in Focus". All about shipping. 24 September 2017. Retrieved 1 January 2019.